Will "Stargates", Giants And Our "True History" Soon Be Revealed? As President Trump Promises We'll Go To Mars, Will 'Stargates', Giants And Our 'True History' Soon Be Revealed? And Is The MSM's Recent Focus On 'Ancient Aliens' Another Sign Of 'Disclosure' Ahead? 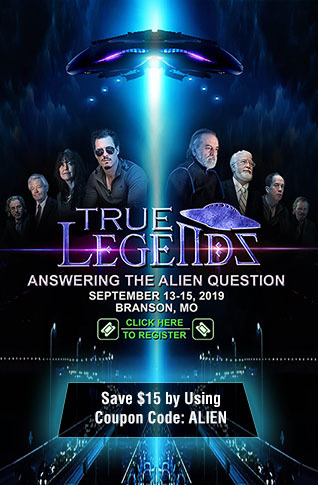 According to this new story from the Daily Mail that Steve Quayle linked to on his website Tuesday morning, an ancient technological species may have existed upon our planet Earth for billions of years before human beings according to one scientist. Claiming that traces of the aliens are most likely 'buried beneath the ground', Pennsylvania State University associate professor Jason Wright believes we could soon discover the 'technosignatures' left by these ancient aliens who apparently 'left without a trace'. Also reporting in their story that Wrignt strongly believes aliens lived on Earth, Mars or Venus long before human beings arrived here, might 'disclosure' or 'false disclosure' be soon ahead? Interestingly, according to a new story from the LA Times, President Donald Trump has set a goal of getting Americans to the planet Mars during his first term in office, "2nd term at the very latest". While it might sound outlandish, Professor Wright's theory might actually help to confirm an October 2016 story from Message to Eagle which asked if there is a genetic ancestry link between the planet Mars and the Earth, claiming "maybe someday we'll know the truth". As Quayle mentioned in an SQnote he left while linking to that story, WAIT TILL THE REVELATIONS FROM ANTARCTICA ARE REVEALED - 'ALL EYES UPON THE STARS WILL SHORTLY SHIFT TO MARS'. And while we have long believed that we haven't been getting the 'truth' about our 'true history' from 'the gatekeepers', as the first video below featuring Steve Quayle, Dr. Tom Horn, Timothy Alberino and Derek Gilbert of Skywatch TV explores, every day we get more evidence that what the gatekeepers such as the Smithsonian Institute are censoring may one day be revealed. 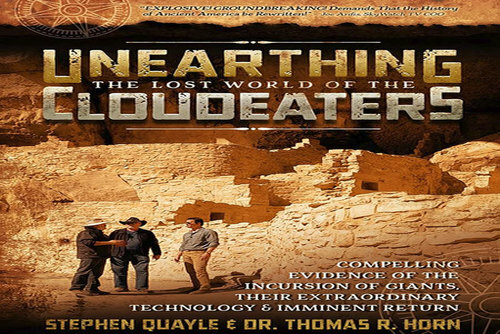 With the gatekeepers holding back from the masses information that could instantly change our view of our planet as we know it, the four discuss Quayle and Horn's new book, "Unearthing The Lost World Of The Cloudeaters", and groundbreaking information that demands that the history of ancient America be rewritten. 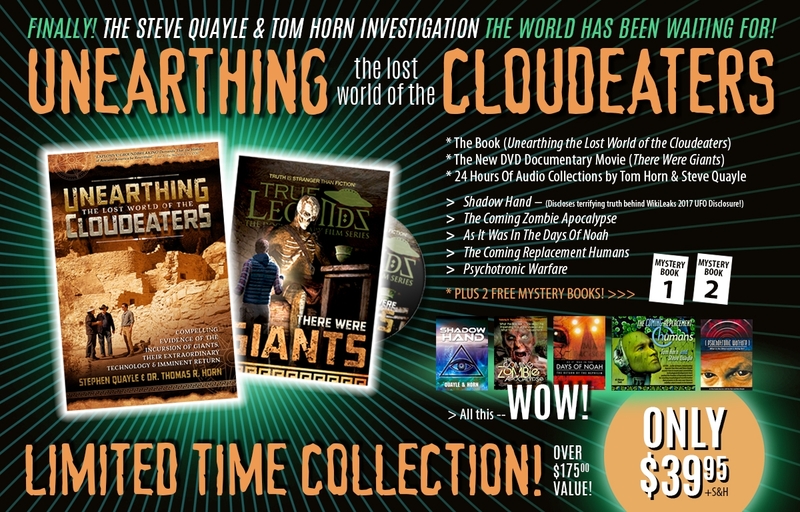 UNEARTHING THE LOST WORLD OF THE CLOUDEATERS is a book unlike any other, one that demands the Smithsonian to open its hidden warehouses so the history of ancient America can be rewritten! As chronicled by Dr. Thomas R. Horn, radio legend Stephen Quayle, and two teams of investigators and film crews (following a secret conference with leaders of the Ute Nation, Zuni, and Hopi tribes) the most compelling evidence is finally unveiled involving pre-Columbian, dragon/giant-worshipping interlopers who traversed the Atlantic Ocean and secret Anasazi routes to corrupt the earliest Americans with portal-opening sorcery, human sacrifices, ritual cannibalism, and technology of the fallen ones. 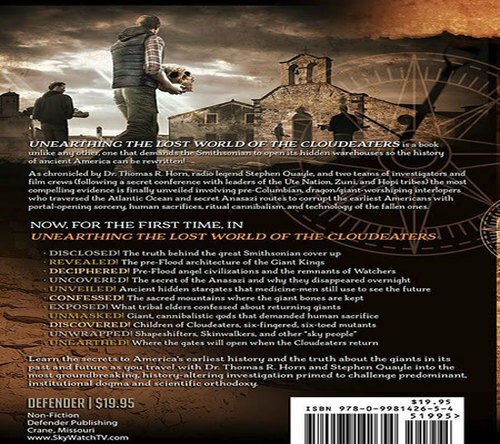 Learn the secrets to America’s earliest history and the truth about the giants in its past and future as you travel with Dr. Thomas R. Horn and Stephen Quayle into the most groundbreaking, history-altering investigation primed to challenge predominant, institutional dogma and scientific orthodoxy. Could 'gatekeepers' such as the Smithsonian Institute be holding back information so shattering that it would instantly change humanity's view of history and life as we know it? As is also discussed in this video, even the US Department of Defense did a study in 1993 into Native Americans 'Sacred Sites' such as those discussed in this video and Quayle and Horn's book, such as ancient hidden stargates and sacred mountains were 'giants bones' are kept. Why might institutions such as the Vatican in Rome and the Smithsonian be keeping information from us? As we learn in this video, much of what we are taught in school as children as well as in our churches is 'institutional dogma' and 'scientific orthodoxy' that has been created to obfuscate from what is true reality. As we asked on ANP back on March 11th of 2017, "might the hidden history of our planet Earth soon be revealed?" with more and more evidence emerging that 'ancient history' under the Antarctic ice might soon be exposed. In the 2nd video below, Realist News discusses Clif High's latest webbot report which includes talk of a 'mysterious energy' coming at the Earth from outer space that leaves people bewildered. Has High's Web Bot Project hit upon something that ties in with 'The Lost World Of The Cloudeaters' and what is being hidden from us? The final video below looks at the story that an 'ancient technological species' may have beaten us to Earth by billions of years. These are truly amazing times that we're now living in.